The huge swell kicked up by storm force southwesterlies last Friday got the better of my date to speak about the Long Hope route back on Hoy itself. It’s a bit ironic really that the most important lecture of quite a lot I’ve done this winter should be the one that didn’t work out. I was really looking forward to talking to the locals about what all the fuss was about for me visiting the island all those times. It was OK though, at least the great audience that turned out in Hoy Kirk watched the film and apparently had a fun night. Sorry about that, and wish it could have worked out a bit better! I only found out the weather had finally got the better of the ferry schedule when I’d driven all the way up to Thurso. Not so keen to turn around and drive the way I came, I decided to go on a tour across to the west and see what could be seen. 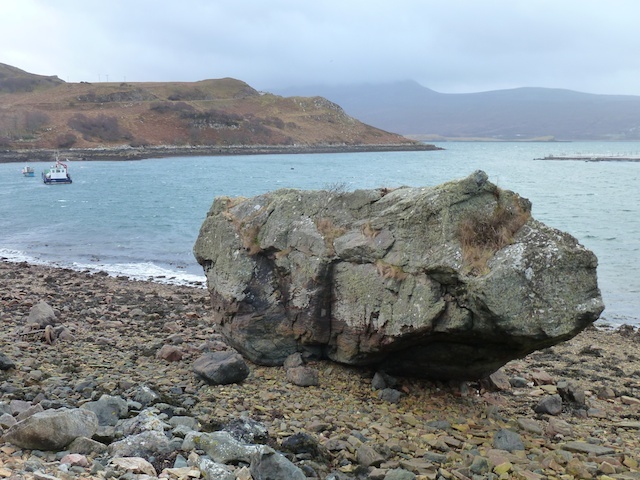 I spotted this fantastic and massive boulder on the beach near Tongue. Apparently called The Keystone. I’d say you’d be hard pushed to find a better looking V5 anywhere than the flakes leading right out through the overhang. Ben Loyal looks like an interesting mountain. I’d love to do a route here sometime. No doubt I’ll get back for a wander about soon. I finished the day on a ridiculously hard boulder project near Sheigra, which after 7 hours driving and a mad dash across the moors in the failing light, 70mph winds and hail squalls didn’t go great. But it raised the psyche for the big drive home. The failure of my Hoy trip meant I could go to some family events in Glasgow. I had three bottles of beer and tried to climb the next day at TCA. Oh dear, I couldn’t get off the floor without shaking myself of the wall in a gibbering heap. Pathetic. Must do better. 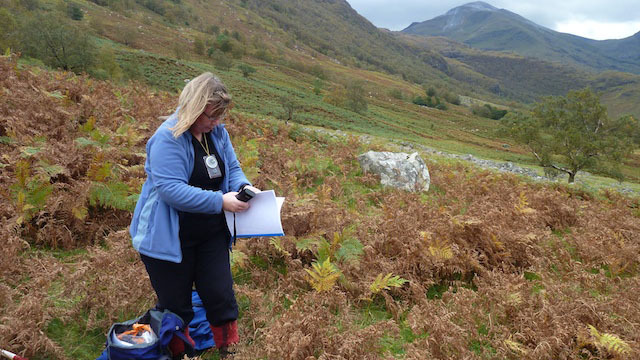 Archaeologist Jennie Robertson surveying in Glen Nevis during her interview for the Glen Nevis podcasts. 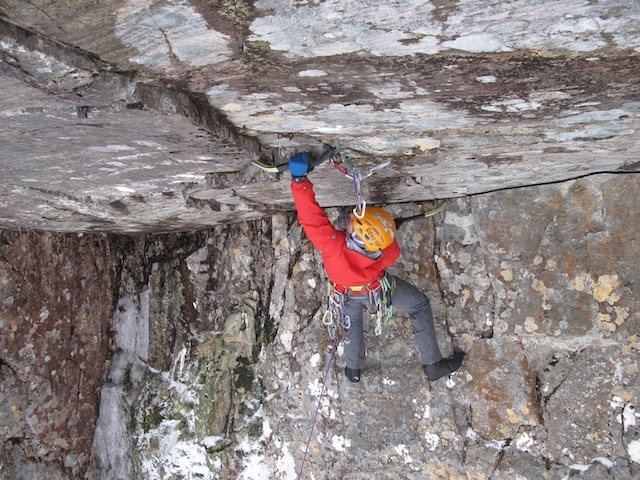 I’ve just uploaded the second episode of the Glen Nevis podcast series. It’s on Friends of Nevis here or iTunes here. 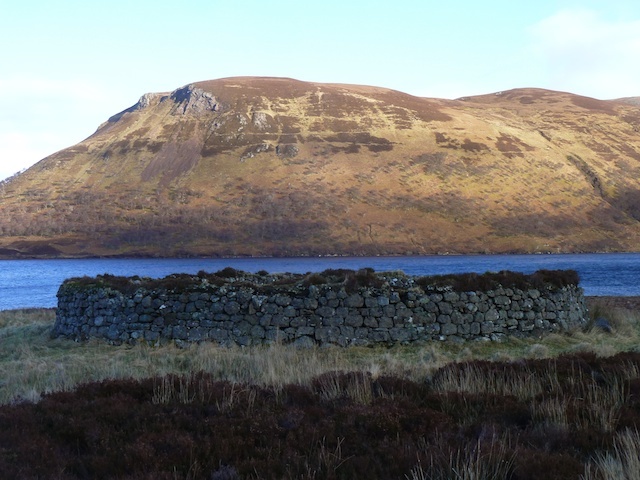 This episode covers the walk to the Iron Age vitrified fort of Dun Deardail which overlooks the glen from a spectacular position opposite Ben Nevis. 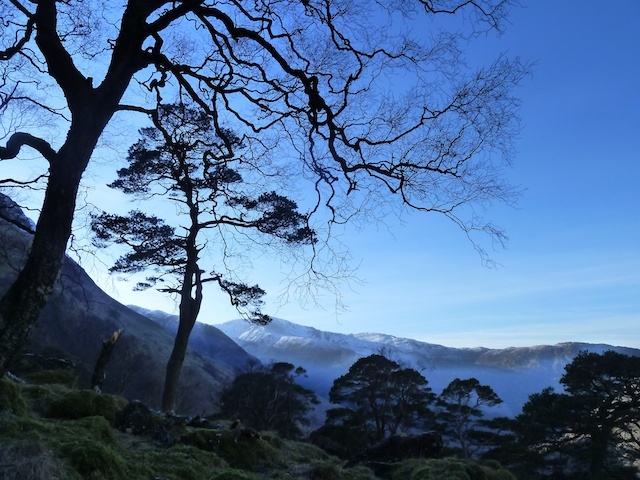 In this episode, we hear from Cameron McNeish and Ali Austin on the ancient caledonian pine forest that once covered this glen, archaeologist Jennie Robertson talks us through the history of the fort itself and the mysterious vitrification applied to the stone walls at great temperatures and Gaelic historian Ron Cameron gives us some leads on where the unusual name ‘Deardail’ may originate from. This route is one of my favourite running routes in the Glen, combined with Cow Hill if time or daylight are short for going onto the bigger mountains. 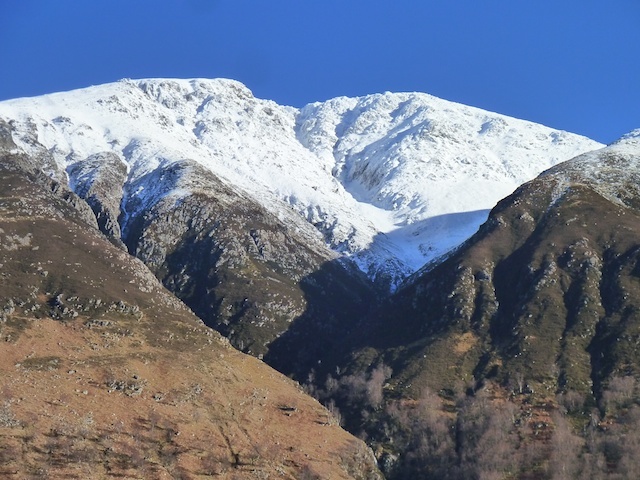 Also in the pipeline from Friends of Nevis right now is an Android phone App for Glen Nevis with lots of details and maps to direct your explorations of the best spots. It's in beta right now but you can download and try it here. The Fort William Mountain Festival asked us to make a short film about Dr Adam Watson to play at the festival, marking his award for excellence in mountain culture this year. I had of course read some of Adam’s work before when I’d just started climbing and was aware of his huge influence in the conservation of the Cairngorms and in many research fields including ptarmigan, snow distribution, Gaelic and many other areas of mountain culture. Like the other people to have received this award in previous years, it was obvious when I went to meet him that he was still very much full of the same energy and interest in his passions as ever, even as a man in his eighties. I proceeded to record a fascinating interview that could have formed the base for a much longer film, on everything from Speyside Gaelic speaking poachers of the Cairngorm deer forests over the past 100 years, to living with innuit in Baffin Island, to the 1950’s Scottish climbing scene, to the qualities needed to underpin a successful contribution to literature and scientific research. Oh, and a bit of Gaelic song! Driving home after a thought provoking day speaking with Adam, his wife Jenny and friend Derek Pyper, I had a new appreciation for the shared interest in mountains and the people involved in them, and felt pretty inspired by the energy that Adam puts into his lifelong effort to document and share his knowledge in writing so many books. The little film we made with the help of Adam, friends and colleagues of his, and a little music from Croft No. 5 is above. Since I last spoke about my roof project on the Skeleton boulder, I’ve had another good few sessions on it. On my last blog I was getting a bit dejected, still unable to find a method for the crux move despite trying seemingly everything. Well, I have surprised myself in managing to find a method to (sort of) do all the moves! How can you sort of do the moves?Technically speaking I have done them, I’ve pulled on each move and climbed the whole thing in three sections actually. But I'm aware that the sections in the crux don’t completely link as my highpoint into the crux move has my body hanging a little lower in a kneebar than where I’ve pulled on and actually done the crux. I won't totally know it will work for me until I can link through the entire section of about 7 hand moves. So there is much, much progress still to be made before I even have a feeling it’s possible for me. But just finding a method that would clearly work for ‘some’ climber is superb progress. Plus, each session I’m still making small improvements and learning new details about the sequence. Now that I’m properly starting to link moves together on it, I’m seeing how to make everything more efficient and getting the excitement of envisioning actually climbing right through the sequence. It still feels very intimidating for me though, until I’m really warmed up the holds just feel terrible. While the Lochaber downpour rules for the next few day, I have some homework; stick to my diet, go for some soggy runs, make a new kneepad and do some much needed antagonist work for my brachioradialis which are not enjoying the repetitive compression moves. One of the nice things about living where I do and working in the outdoor field is being involved in creative projects. Over the past few years I’ve made films and written books but recently I was asked to do something new for me - produce a series of podcasts! Claire and I have just finished a series of 6 podcasts about Glen Nevis on behalf of Friends of Nevis. If you haven’t heard of Friends of Nevis, they are the charity that looks after Ben Nevis and Glen Nevis. We were asked to produce and present 6 episodes and interview interesting folk who are connected to the place in some way. They are structured around different low level walks you can do in the glen, but it really doesn’t matter if you walk them, bike them, run them or use them to get to the cliffs! 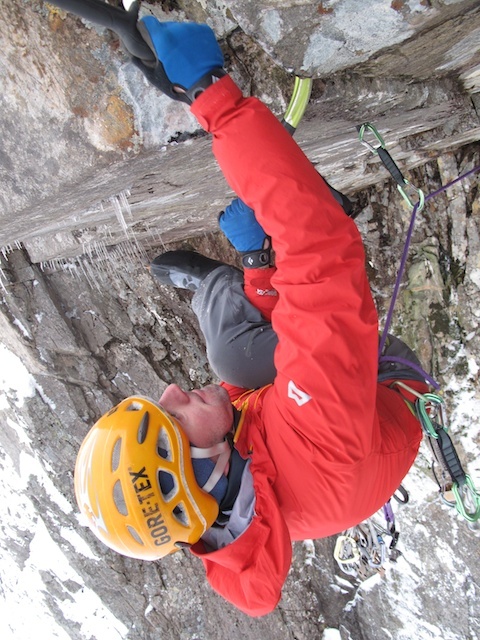 I spend a big chunk of my life training in the glen, hence being asked to produce the podcasts, but although I know a lot about one aspect of the place (the climbing history and landscape), there are many other areas I had much to learn about; the natural and human history, geology and ecology. So we had a great time interviewing many different experts in their different fields and putting together the episodes. The first one is uploaded now and you can stream/download it and of course subscribe to the others on the Friends of Nevis site here, or on iTunes here. I’ll be uploading the episodes weekly. The first one covers the lower part of the glen and in it I talk to Cubby Cuthbertson about almost falling down Five Finger Gully above this part of the glen, Mick Tighe about the first winter ascent of one of Scotland’s longest gullies - Surgeon’s Gully - and how it got it’s name, archaeologist Jennie Robertson about the remains of ancient clan settlements you can find hereabouts if you know where to look and geologist and climber Noel Williams about the upside down geology of the Mamores range of mountains. By the way if you would like to show your appreciation for this (free) production, the best way would be to make a wee donation to the charity on the Friends of Nevis site here (button at bottom of page). Every year they build the excellent paths you walk on the Ben and in the Glen, remove and carry literally tons of rubbish from these places and work to improve the facilities and the landscape generally. It’s pretty good work! I just had a couple of sessions on the Skeleton boulder project without any success to speak of. The rock seems to be particularly unyielding to my attempts to be inventive with the sequence. It’s a classic boulder problem - enough holds that it’s obviously possible, but they are so unhelpfully arranged that it defeats every possible option. For my strength level at least. And there is the rub. I don’t think I can do much more with sequence cleverness. I’ve been trying to because I know that if I’m forced to stick with my current sequence, I don’t just need to be a little bit stronger. It would need a substantial change to my strength/weight ratio. People often ask me, especially at climbing lectures about fear and sense of mortality that climbing risky routes could highlight. I don’t have think (or at least dwell) too much about this on risky routes because I try and do them with a good reserve of control and never really get too scared. Actually, it’s trying super hard physical climbs like in bouldering that most strongly reminds me of the constraints of life. After yesterdays rather miserable performance on the roof, I was acutely aware that I don’t deal very well with the idea that some things might not be feasible for me. I’ve never really had to experience that yet. In that sense I’m a bit spoiled! I usually feel that it’s possible and just a matter of how much effort you are willing to put in. And I’ve realised from personal experience that you can always put in far more effort than you estimate in advance, so long as you start sufficiently down the road and then refuse to give in when progress grinds to halt. Freida is a great daily reminder that progress can happen. Five Finger gully bathed in February sunshine. Thanks to everyone who came out to our lecture in London the other day. Getting pumped and scared at the lip of the roof on Castle in the Sky, Druim Shionnach. Photos: Andy Turner. A few weeks ago I mentioned I’d tried a huge roof in winter. 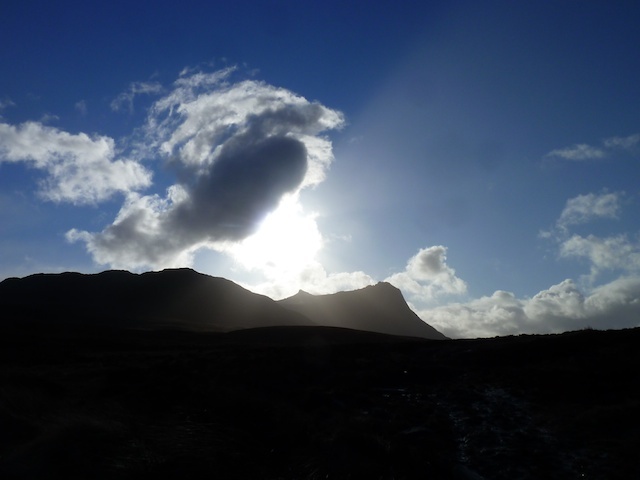 It was up on Druim Shionnach on the Skye Road, about half an hour from my house. Things didn’t go very well with that. I tried it maybe three times and on my last try ripped out a tiny chockstone in the thin crack in the roof that was crucial for the crux lunge in the middle of the roof. After that it was a parallel crack and neither myself, Donald or Michael could work out how this section could go. So for now at least (I never say never), I was a bit stumped. But at the end of the day I had a brief foray on the roof just to it’s left. About 5 metres straight across the smooth horizontal roof with no crack system to follow. I tried to aid across it just to see if there could be any hooks at all. It looked like an outside chance of being possible but at a silly grade. I had another session to aid around the lip and see if it might be possible. Just aiding was scary enough. I was forced to aid mostly on my axes on tiny hooks as there was very little gear in the roof or around the lip. In the end all the protection after the first metre in the roof was one poor downpointing blade and one pecker on the headwall. I was pretty sure a fall would strip them both and would mean a long fall and big smash into the lower wall. But at least I found some hooks and could see that it might go with 2 figure-four moves in a row across the roof. There would be nothing for it but to have an all out go for it and make sure I didn’t fall off onto that gear! Andy Turner and Ruth Taylor came up with me and Andy abseiled down to take some pictures and provide some much needed encouragement. The VII wall below the roof was the perfect warm up and I arranged the little cams at the start of the roof, changed gloves and got nervous. Eventually there was nothing for it so spanned out from the undercut hook at the back and launched out. Cutting loose onto the first hook, I swung out to see it wasn’t in the hook at all and hanging off a microscopic nubbin. As I dangled wondering what to do I explained to Ruth in a heated manner that I was about to lose my only point of contact with the roof. Rather than try and get a figure four in, which would surely rip with a head first fall, I attempted the start of a one armer and got as far as pulling my shoulder in a bit! That was enough to just reach into the next undercut hook and I was back in business. All this rather washed away the nerves and I slipped into committed mode and started the figure fours across the roof. The crap peg was still very comforting to clip before turning the lip and pushing on with total commitment turned rapidly to fear on the thinnest hook I’ve used on a trad route. All of a sudden I was at the last move. A big spiky flake just out of reach, fiddling to find a hidden torque in a flange of schist. There was enough time to think “what if that torque rips?! I’m going to fall the full distance!” I held that thought in the back of my mind through a careful cross into the flake and glorious lumps of frozen turf on the ramp beyond. Woohoo! The last 30 metres was much easier at about tech 6 but with non existent gear, so I tried hard not to rush and keep it steady. An amazing little route and definitely one that revives the psyche that there are good mixed projects out there in Scotland. I must admit after I did Anubis a couple of years ago my focus shifted a bit towards bouldering as I wasn’t sure what was the right routes to keep progressing with my winter climbing. I’ve called it Castle in the Sky which seems quite nice and the expression reflects how these super hard winter projects seem sometimes. I don’t have a grade for it except to say that it’s both hard and dangerous. It might be safer if a crack near the lip wasn’t choked with ice and would yield a well positioned cam. Since there aren’t really any routes other than my own to compare it to, I have to compare it to them!! A grade harder at least than Don’t Die maybe (which could be X,10 after Greg’s excellent second ascent recently according to Climb Magazine??) It probably fits within the same ballpark grade as Anubis too, whatever that should get? As you can see from the pictures, it doesn’t look like your average Scottish winter route. That’s because it’s not. It’s not a gully, it’s not a snowy turfy corner. It’s a big square cut cave, so it doesn’t get rime or snow in the roof. It’s good to have something different, otherwise things get boring.